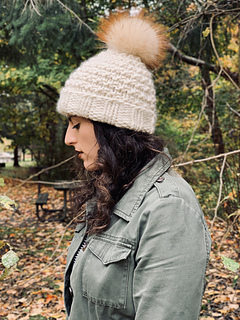 Wintry perfection in hat form. 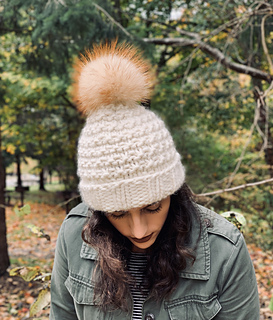 Texture, a wide brim, and a poofy pom pom just scream “cozy cold weather essential”. 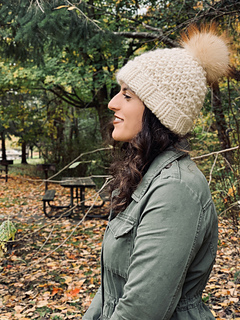 Makena is a chunky beanie with a bohemian vibe that can easily be knit in a day or over a weekend. 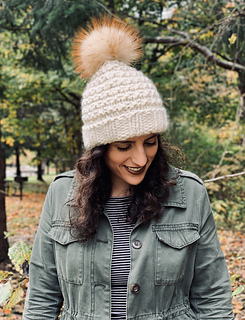 Top with a pom pom or rock it without! 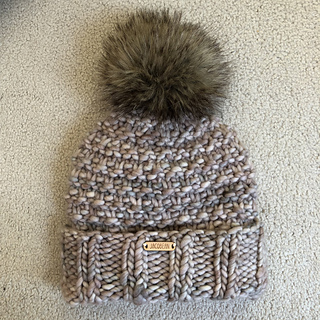 • This hat is cast on at the brim. Decreases are made toward the top and the final stitches are cinched together with remaining yarn. 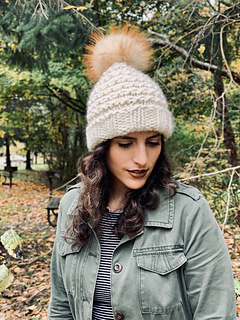 • If you want to make this hat but without the large brim, simply knit 2x2 rib for 2.5 inches and continue with the pattern. 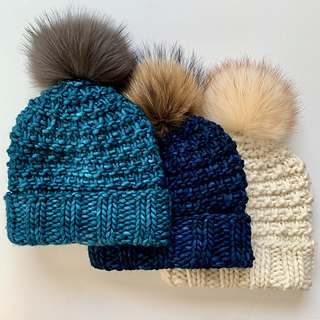 Consider knitting one additional pattern repeat if you want to make the hat slightly taller (you will not have enough yarn for this if you knit the wide brim). • I am a loose knitter. If you tend to knit tightly, consider using larger needles. • Approximately 84 yards/140 grams of super bulky yarn. Suggested yarn: Malabrigo Rasta (90 yards/150 grams), shown in Natural. • US Size 13 (9.0 mm) 16” circular needles. • US Size 15 (10.0 mm) 16” circular needles. • US Size 15 (10.0 mm) DPNs. 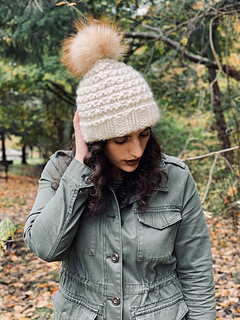 • Fur/faux fur pom pom (optional). • Tapestry needle and scissors. Gauge: Worked in 2x2 rib (k2, p2) with smaller needles. Approximately 9 stitches/15 rows = 4”. Dimensions: Circumference: 17” unstretched at the brim. Height: 9”. Width: 8.5” across at the body.